When it comes to preparing meals (and beverages) for my family, one thing is always a priority - healthy nutrition. It’s no surprise then that I’ve made Matcha Green Tea Powder a big part of my family’s daily intake as soon as I’ve discovered it and learned about its many benefits. Both of my sons are momma's boys, and I still make them milkshakes and smoothies on the weekends - that's how I came to the idea of adding some healthy stuff in there. The best thing about it is that there’s more than one way to consume it; don’t be fooled by the word “tea” in its name - you can also add it in smoothies, as well as all kinds of baked goods. If you want to learn more about this healthy green tea powder, you’ve come to the right place. What’s The Best Way To Use Matcha Green Tea Powder? Matcha Green Tea Powder has gotten a lot of attention lately; it seems like everyone is drinking it nowadays – and there are many reasons to do so. But what exactly is Matcha and where does it come from? Matcha is a premium green tea powder from Japan that can be used for drinking in the form of tea or as an ingredient in cooking recipes. It’s actually unique to Japan, and it has been celebrated in the traditional Japanese tea ceremony for hundreds of years. The best way to describe Matcha green tea powder would be to say it’s a great antioxidant and a natural weight loss aid, a mood-enhancer and as I found out when I started drinking it, a healthy sugar-free alternative to coffee, as it gives you the needed energy without the jitters. I did some serious research on this – after all, if I am going to serve something to my family as a healthy addition to our diets, I want to know exactly what I’m giving them. I’m sure you get me. The things I came to learn about benefits of Matcha green tea powder are nothing short of amazing. The exceptional nutritional value is the essential part of what makes Matcha stand out in a market filled with green teas. The numerous health benefits are what Matcha is renowned for – it’s full of nutrients, antioxidants, as well as fiber, and I’m sure you know these are all things that will improve your overall well-being. Why are the health benefits of Matcha so superior to other green teas? Because, to put it simply, people who drink Matcha ingest the whole leaf, while "regular" green tea drinkers are just consuming brewed water. Here’s something to think about the next time you reach for the regular green tea in the store: when it comes to nutritional value and antioxidant content, one cup of Matcha is the equivalent of 10 cups of green tea. On top of everything I’ve just said, it also contains an amino acid known to relax the mind, which makes it a great mood enhancer, too. As an addition to our everyday diet, Matcha was proven to be versatile and flexible. If you want to prepare Matcha in the traditional Japanese style, all you need to do is just add water to it – it’s pretty straightforward. When it’s stirred with water, it turns into this intense, full-flavored green tea. Of course, not everyone will enjoy that rich green tea flavor. I get it; my boys aren’t big fans of it, either. That’s why I’ve discovered other ways to include it in their diet – by adding it to my cooking and drink-making recipes. It works exceptionally well: when it’s added as an ingredient, Matcha’s taste becomes more subtle. So, if you want to make it a part of your family’s diet without them complaining about the taste, this is the way to do it. Matcha will add the nutrients and the distinctive green color to your recipes, and the other ingredients will work together to mask its flavor flawlessly. As always, I encourage you to experiment as much as you can by adding Matcha green tea powder to yogurt shakes, milk drinks and cocktails, either by using a blender (for mixing it with yogurt and ice cream), or an electric whisk (for milk drinks and cocktails). You can even try adding it to pastry and different kinds of sauces. Adding Matcha green tea powder to your diet is a big step towards a healthy lifestyle. However, choosing the right one is a bit more complicated than buying the first one you lay your eyes on. The first two, kitchen and cafe grade, are excellent for blending, so if you plan to make a lot of smoothies, it is better to choose a product that falls somewhere in this category. Classic grade and ceremony grade matcha powders are meant to be consumed as a traditional tea, so if you are a die-hard tea lover, you will probably enjoy there two types way more. What determines these differences? It’s all about what your specific needs are. Personally, I like to have a bit of both. If I’m using my Matcha powder as an ingredient, it makes sense to use a kitchen or cafe grade, but when I want a nice cup of tea, I will turn to a finer, ceremony grade Matcha. With all teas, one the most crucial things to look for are the taste and the aftertaste. The taste of good quality matcha itself should be rich, creamy and fresh. The aftertaste shouldn't, no matter what, leave a bitter flavor or a strange aroma. The color of matcha powder isn't the most crucial thing, but it does make a slight difference. The color usually indicates higher quality production and processing, so when you see a vividly vibrant green matcha powder, that's when you'll know how good it actually is. On the other hand, matcha powders can be brownish or greyish, but can still taste amazing. The main difference is that, if you want to prepare food or beverages with matcha, keep in mind that you won't get the green you were going for. Packaging is essential for a couple of reasons. First, you always want to keep your matcha powder fresh, so having a bag with a tight seal can help you significantly. Second, depending on your needs, you will want to go for bigger or smaller packages. If you are a tea lover and plan on consuming matcha in an old-fashioned way, a bag of 20 servings will be too little for you. On the other hand, if you are still experimenting and you want to try out matcha before committing to it fully, you should go for smaller packages. A thing I simply can't stress enough is dissolving, and it's crucial for all sorts of powders, but especially tea powders. With matcha powders, proper dissolving is necessary for a pleasant tea-drinking experience, and even for some recipes with matcha. Nobody likes to have remaining bits of powder in the bottom of the mug or teapot, and it can quickly ruin a usual tea lover's day. You know I’m the type of person that likes to do a detailed research before I move on to recommending you reliable products – my matcha green tea powder experience was no exception. When you try all these different brands and grades of matcha, you get the idea what you can expect from that particular product as soon as you open the bag. 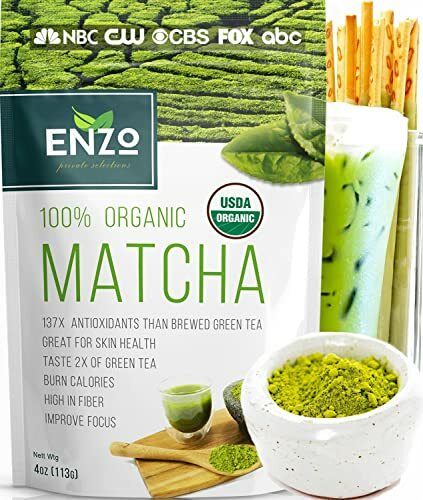 Let me tell you: when I first opened the Encha Organic Matcha (which is a ceremonial-grade matcha, by the way) I was pleasantly surprised by its color; not only was it green, it was vibrant, to say the least. I’m particularly picky when it comes to matcha’s taste. Don’t get me wrong, I like its natural flavor, but there are some brands out there that make matcha unbearable, even for me. You’re probably wondering if Encha is one of them. The best way to describe the taste of this matcha is what you would imagine green tastes like. Refreshing, even a tad bit sweet, but with the balance of flavors intact, so the sweetness doesn’t cancel out that characteristic "grassy" taste entirely. And when I say "grassy" I don’t mean that in a bad way; it’s actually surprisingly pleasant. This is the one I was excited about trying; even though it's technically a Culinary grade, it still offers the taste and color of a Ceremonial grade Matcha. If you’re looking to start your day with something that will give you tons of energy, improve your concentration and add a lot of organic nutrients, this one might be the right choice for you. The fresh, vibrant color, silky texture and a taste richer than any other product currently available on the market, make this matcha a high-quality product. You need to pay attention to product information, though, so you won’t be surprised at how small the package is. I would say it's a good size to get a few servings and decide if you like the brand or not before buying a larger package. Other than that, the package itself is resealable and seems pretty durable, which is crucial when it comes to preserving the freshness of your matcha powder. Even though there are some cheaper Matcha powders on the market (and even here, on my list), the rich taste and the vibrant color you get from this one are worth the price. My family agrees with me on this one, which is a pretty big deal because they’re just now learning to appreciate Matcha with its many benefits. Here we have a 100% certified organic Matcha made and sold by Kiss Me Organics. This product works as a powerful antioxidant and a natural calorie burner, which is great if you’re looking to not only improve your health but work on your weight at the same time. Another marvelous feature is that it will give you lots of energy throughout the day, and if you do continue to use it for an extended period, you will feel the detoxifying effects it has. It can quickly be whipped into a latte, or added to smoothies, sauces and baked goods; when it comes to using it for culinary purposes, the possibilities are endless. Even though I’ve found that this matcha powder mixes well with water, it doesn’t dissolve completely - you can expect some settling. The best way to deal with this is to stir it before enjoying the last few sips. The packaging itself is rather simple – it comes in a resealable zipper bag that provides enough information about the product at a glance. It does cost a bit more than other Matcha powders on this list, but if you ask me, it seems a small price to pay for such a healthy addition to your diet. This is a matcha green tea powder made and sold by Enzo’s Private Selection. It has a characteristic, strong yet milky taste, which is great for someone who is just getting used to drinking matcha green tea. It has, in fact, proven to be a great substitute for my morning cup of coffee – it gives me the much-needed energy without the annoying jitters throughout the day. The packaging is resealable, which makes it easy to keep the powder fresh once you open it, although it’s somewhat small. Don’t let that put you off, though; the amount you’ll need to get the desired taste and color is minimal, so there’s no real need for it to be bigger anyway. I was worried about the color, as it seemed a bit darker, more brownish than that of a typical Matcha green tea, but I guess I got used to it with time. I’m going to be honest with you: I do believe there are some higher quality products on the market for the same amount of money I spent on this one. But on the other hand, the seller does have a refund policy, which makes trying out this product worth a shot. 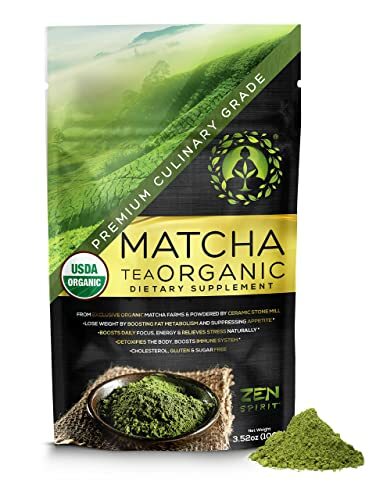 This is a Classic Culinary Grade matcha green tea powder, which means it’s an affordable way to add a delicious, healthy boost to your smoothies, lattes, baked goods and other recipes. When it comes to packaging, one great thing is that it’s entirely resealable, which did help maintain the freshness of the product. Even though the package seems small (30g/1oz), the number of servings you get from it is pretty good, because you don’t need much – serving size is ½ tsp, so you get a good 30 servings per bag. Keep in mind what I’ve previously told you about different matcha grades; this is a culinary grade matcha, which means it will work better as an addition to your baking recipes, than as a regular tea. The good thing is that the package contains a website address where you can find some great recipe ideas that include matcha green tea powder. I used it mostly for making green tea ice cream, and both the taste and color were great – not too strong and very refreshing. You should know that this seller has a refund policy, too, so in case you find that this product is not suitable for you, they will gladly give you your money back. As far as the price goes, this Matcha powder is the budget-friendly one. While I don’t think that higher prices always mean better quality when it comes to this particular product, I have to say – you get what you paid for. The taste was a lot more "grassy" compared to other matcha green tea powders on this list, with a hint of natural bitterness to it, which can be considered normal, given the fact that this is an all-natural powder that contains no preservatives, sweeteners or additives. If you are, in fact, new to matcha, it might be a better idea to mix it in your smoothies and lattes, rather than drink it in the form of a tea; give yourself some time to get used to the taste. What I liked about it is that it does dissolve relatively well and does not clump, so it doesn’t leave that powdery aftertaste. Another good thing about this product is that it works great as a substitute for artificial food coloring, which means that my family can expect a lot of green cakes in the near future. What I didn’t like is the fact that, even though it did come sealed, once opened the bag wasn’t resealable, so I had to get another zipper bag to store the product in, but that’s a relatively small inconvenience. Not as mild flavored as some of the other products on this list, to some it might even taste "earthy"
The Baahtcha matcha green tea powder is a ceremonial grade, so it's great for all you tea lovers out there. 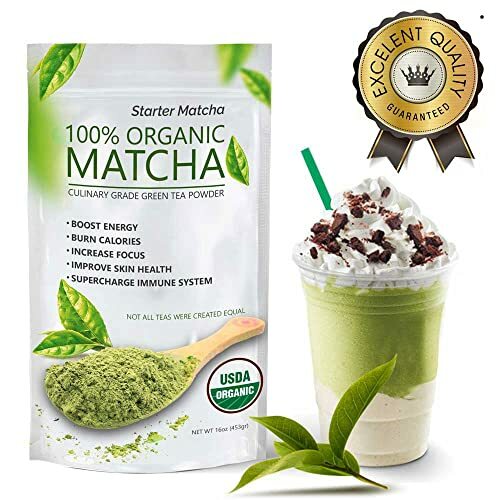 But, as you know, I love to bake and make all kinds of drinks with matcha, so I tried this powder for lattes, smoothies, and matcha cupcakes as well - it all worked fantastically. As far as the taste goes, I didn't notice any strange aromas, and it definitely didn't have a bitter taste. It's also not too strong, so even beginners can do really well with this matcha powder. I noticed that drinking a cup of this tea increased my energy for the day, and it calmed me, so that's another thing to consider, and it also dissolves quite well, at least in the form of tea. The packaging itself is very well done and comes with a resealable bag. It even comes with a small, bonus scoop to help with the right portion size. I love the color of this matcha green tea, it has a rich dark green color, and the taste is amazing, not too strong but still strong enough to keep you up. My matcha cupcakes are vibrant green from this powder, as well as all the beverages. All in all, this is a really good purchase, and I don't have anything bad to say about this matcha powder. The Amaya matcha is an authentic Japanese matcha that comes directly from Kyoto- the manufacturer prouds in having no middle-man, and that's why their matcha powder is excellent quality. The grade of this powder is ceremonial, it's all natural - no sugar, no preservatives, no fillers. I used this matcha almost exclusively for drinking because I didn't want to "waste" it on anything else! I was blown away with the taste and even the smell of this matcha powder. It's very creamy, clean and has no bitter taste or aftertaste. It has bright citrusy notes with hints of baby spinach and has a pleasant finish that’s on the sweet side. Unlike all other matcha green tea powders on this list, this one is packaged in a tin (not in a bag). This doesn't change anything as far as the taste is concerned - it's more of a personal preference. The package is a 30g tin, so you have around 30 servings. The color is also a good, vibrant green, so you can put this powder in all your baked goods. I must admit that I was a bit disappointed that this matcha is non-organic, so for all of you who appreciate organic products, you might need to search elsewhere. A great thing about this matcha powder is that you can get a full refund if you aren't satisfied with your purchase - no questions asked. Matcha prices don't vary much - but this is undoubtedly one of the less expensive ones. However, that doesn't mean it's of lesser quality. 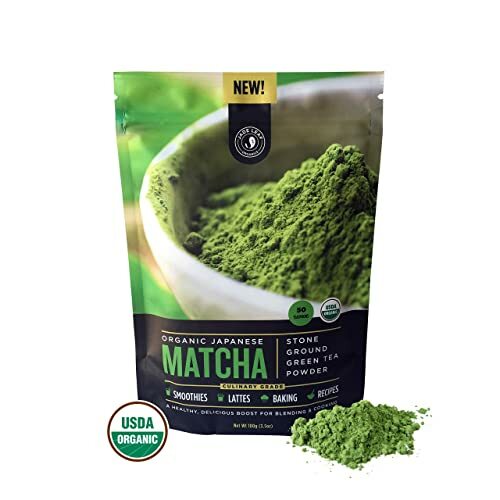 This matcha powder is USDA Certified as organic, has no food coloring and sugar, and is a premium culinary grade. I love that it's all natural, which also explains the fresh smell and taste this powder has. The packaging is enormous - a 100 grams of pure powder makes this product worth your while. It's packaged in a tightly sealed bag, so your matcha remains fresh for an extended period of time. As this is culinary grade matcha, I typically use it for beverages and sweets. I enjoy making lattes and different kinds of desserts like cookies, cupcakes, pancakes and even swiss rolls. I had to test how it dissolves, so I tried a cup of tea made with this powder. Although it had dissolved, the process was slow, and you can tell this powder isn't made for tea-drinking. Therefore, if you are looking for that, this matcha powder won't be good for your needs. The taste isn't bitter - it even tastes a bit sweet because of the mixture of amino acids in the powder. However, I still recommend this primarily for cooking, especially when you have a color as rich as this. The manufacturer also provides a guarantee - if you aren't satisfied with the product, you have 30 days to get your money back. When I was deciding which one of these Matcha green tea powders to label as "the winner," I had to take into account not only mine, but the opinion of my family, and we all agreed that the title should go to Encha Organic Matcha (Ceremonial-Grade). As a ceremonial grade matcha, it provides everything a green tea lover like myself could ask for. The decision was not, by all means, easy to make, as all the products on the list do share a lot of the same qualities, but Encha definitely takes the cake. Thank you for sharing! You gave me a roadmap to continue my journey. Matcha Konomi also has Akira (organic ceremonial) and Oishi (organic gourmet). I haven’t tried either of them, but saw your note about how Amaya isn’t organic. I have the Jade Leaf you reviewed at home. Mine was pretty vibrant in color. I also see they have a premium ceremonial grade that comes in a tin. Although, it’s one of the most expensive options I’m seeing. I’ve noticed that the color goes away over time, so I’m wondering if you got an old package of the Jade Leaf. I recently read to store opened packages in the fridge. Where do you store yours? Hello Adam, and thank you for your question dear! I’ve tried some other Matcha Konomi tea powders, though not the ones you mention, but I can confirm that none of them were organic. It’s sad but I would recommend avoiding the brand if you want everything you put in your body to be organic. As far as storing my Jade Leaf I also store it in the fridge, but I usually take it out of the bag and put it in an airtight container first. It’s something I do with most things before I put them in the fridge. That way they don’t absorb other smells or spread their own. So far, it seemed to work fine for me and the tea keeps the color it always had. But then again, we spend it so fast and it never lasts for more than a week or two! I don’t know if it would lose the color if I kept it there for months. I hope I was able to help you at least a little bit, Adam. Good information.I love matcha. just curious are these brands all come from Japan, I look through some of the brands you recommend. looks like some are from China, especially the low price point matcha. I usually order from Matchasisland. It’s a bit expensive than the brands selling on Amazon. but it’s very good quality. if you find something good price and amazing quality better than this, please please let me know!! thanks! I’ve heard of Matcha Island before but I’ve heard mixed things about it – some people praised it, like you, while others didn’t like it so much and complained of slow delivery. I haven’t tried it myself though, so I’m not sure what to think about it. It’s true that some of the matcha that I recommended here comes from China, but that doesn’t mean it’s poor quality. I’ve found that doesn’t impact the quality as much as you would think. However, if you insist on getting something from Japan and want high-quality matcha, Matcha Konomi is definitely a brand I would recommend. I’ve found it to be great in most regards, even if some of their products aren’t organic. I’ve heard nothing but good things about them, which I can’t say for Matcha Island so there’s that. I hope I’ve helped at least a little bit! Feel free to ask anything else if you want to, I’m open to it.